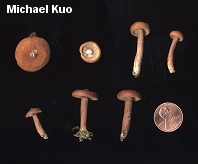 I have just pulled out several dried specimens of Lactarius camphoratus, collected years ago, in order to study them--and I am wondering whether their fragrant odor will ever cease permeating my house. The odor, which is fortunately not unpleasant, has been variously described over the years. Jean Baptiste François Bulliard (apparently he went by "Pierre"), the French botanist who originally gave the species its name in the Eighteenth Century, obviously thought the odor of camphor was similar; other authors have used comparisons to the bark of slippery elm, maple syrup, burned sugar, and curry. Whatever it smells like to you, however, you will have no trouble detecting it. I have noticed a similar (but weaker) odor that develops in some dried specimens of morels. Our North American version of "Lactarius camphoratus" probably deserves a healthy set of quotation marks. It may or may not represent the same genetic entity originally collected in France by Bulliard, and there might easily be more than one North American genetic species--especially given the wide range of mycorrhizal associates and the apparent variability in several morphological features. 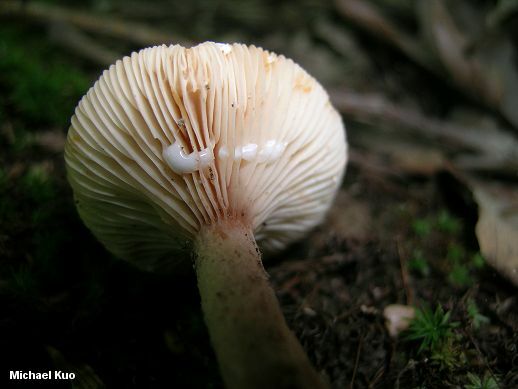 Eastern North America's Lactarius fragilis is very similar, but has watery latex, yellowish gills, and (more definitively) spores that are reticulate. On the West Coast, Lactarius rubidus is a similar but larger species with reticulate spores. Ecology: Mycorrhizal with conifers or hardwoods; growing alone, scattered, or gregariously, often in moss; spring, summer and fall; widely distributed in eastern North America. Cap: 1-4 cm; convex, becoming broadly convex or centrally depressed, usually with a sharp central point ("papillate"); moist or dry; smooth or very finely dusted; dark reddish brown, often fading to rusty brown or orangish brown; the margin sometimes becoming scalloped and/or lined with age. 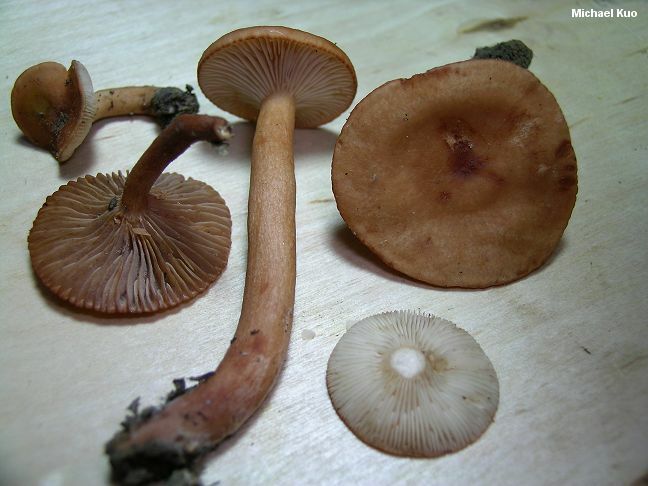 Gills: Attached to the stem or running slightly down it; close or crowded; whitish to pale pinkish, often developing reddish to cinnamon tones with maturity but not staining from the milk. Stem: 1.5-6 cm long; up to about 1 cm thick; more or less equal; smooth or with hairs near the base; without potholes; colored like the cap, or paler, especially toward the apex. Flesh: Pale cinnamon to whitish; brittle and hard; not staining when sliced. Milk: Milky white when young and fresh, but often whey-like or watery by maturity; not staining tissues--or, in some of my collections, staining tissues very faintly pinkish. Odor and Taste: Odor like maple syrup or burned sugar (etc. 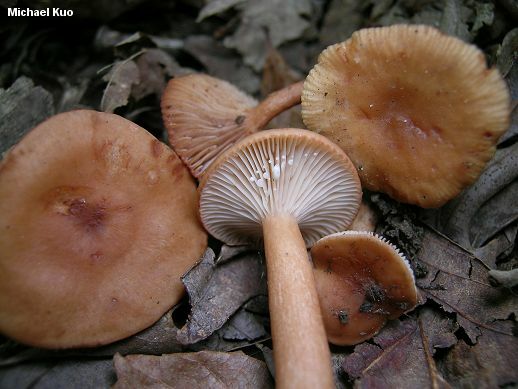 ), becoming stronger when the mushroom is dried; taste mild or slightly bitter. 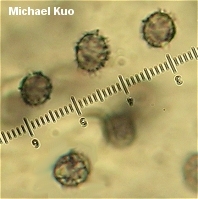 Microscopic Features: Spores 7-8.5 x 6-7.5 µ; subglobose to broadly ellipsoid; ornamentation 0.5-1.0 µ high, as isolated warts and scattered ridges that do not form consistent reticula. 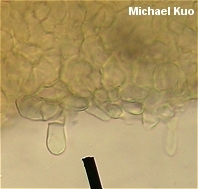 Pleuromacrocystidia rare to absent; to about 40 µ; not projecting. Cheilomacrocystidia rare to abundant; variable (subclavate, subcylindric. fusiform, irregular and nearly lobed, etc. 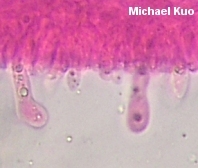 ); to about 40 X 6 µ. Pileipellis a hyphoepithelium. REFERENCES: (Bulliard, 1793) Fries, 1838. (Saccardo, 1887; Coker, 1918; Kauffman, 1918; Hesler & Smith, 1979; Smith, Smith & Weber, 1979; Phillips, 1991/2005; Lincoff, 1992; Heilmann-Clausen et al., 1998; Roody, 2003; McNeil, 2006, Miller & Miller, 2006.) Herb. Kuo 06119603, 06050301, 06010405, 05300701, 06160802, 05191004.